I see young kids at Stones shows and they look so miserable, usually sprawled out on the ground asleep by the end. They are there purely for their parents' gratification, Take them to Peppa Pig instead. 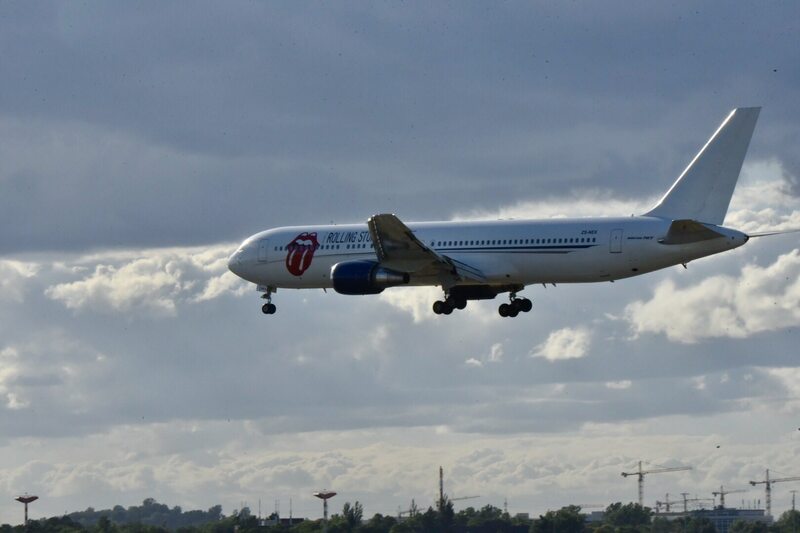 The Stones are landed in Berlin at BER/SXF-Airport. Takeoff was 21-Jun-2018, London-Stansted, 4:25pm BST. Landing was Berlin-Schönefeld, 18:33 CEST. Looks like the plane is parking (like in 2014) at the BER-position P7/P8 which you can see a little bit from the fence at the Bundesstraße B96a/Waßmannsdorfer Tor. Edited 1 time(s). Last edit at 2018-06-21 19:50 by Irix. The weather in Berlin is at the moment 17°C, (slightly) cloudy, no rain. "The Marie-Elisabeth-Lüders-Haus is one of the buildings in the new parliamentary complex in the new government quarter of Berlin. It is the functional and architectural complement of the Paul-Löbe-Haus to the west, which is the Bundestag’s committee building and the parliamentarian’s office building. This design applies a Bauhaus approach to the Haus’s external elements." There are 200 standing places available again. PIT A: 85, PIT B: 103. It looks like they are moving the boundaries. I don't think that they are changing the layout of the venue (that's too late now). BTW, Dean, may we hope for a report from you from Berlin? And from where will you be watching the show? Have a blast and maybe see you there. Jawohl. Agreed on the weather. All over the place this afternoon. Blue skies but rather windy at 8 pm. Best tshirt design for a long time. 2 Lucky Dip for sale for tomorrow, 120€ total. Anyone interested? Edited 1 time(s). Last edit at 2018-06-21 21:32 by engerling23. When starts pick up time LD? Edited 1 time(s). Last edit at 2018-06-21 22:32 by piscatorFL. An article about the Landing of the RS-Airplane: [www.BZ-Berlin.de] . At the moment there are 79 PIT A-Tickets and 95 PIT B-Tickets available. Just arrived in Berlin from London ! Freezing my nuts off ! Going to the pop-up store tomorrow morning before the show. I landed at Berlin-Schönefeld just 50 minutes after The Rolling Stones, coming in on a Norwegian flight from Oslo. The flight was extremely bumpy the last 10 mintes, and the landing was very rough, unusual rough. I assume the Stones had the same rough landing, wind in all directions, arctic weather in Berlin now, and people dressed with winter jackets! so who else is excited for tomorrow's show? What time should i arrive to start queuing, so i can get a good spot with my "standing field" ticket??? Super excited too. Goin to drive in from Hamburg around noon. I know how you feel...will be hard to catch some sleep tonight. We've been to Düsseldorf during 14 on fire...but had some awful seats and she kept saying "awww i wish we could be down there where all the action is"
2 Lucky Dips still available for tonight´s show! 120€ total. Pick up at the box office with me being present (picking my pair as well). Edited 1 time(s). Last edit at 2018-06-22 09:14 by maumau. Going to be a great night! Best one this tour, Gotta catch one. Off to Berlin to meet up with Mr.Jimmy for a lucky dip..Let you know how it goes...Berlin,Beer,Bratwurst,By Bus,Pit b....Well Will see...Have a Great night everyone!!!! Been reading backwards and upside down this morning. LD check-in not available before 17:00? Don't care. On a very wet train from Frankfurt, hope the weather will be better. Or I have to do some shopping.